Veraval is at the centre of the Gir Somnath district and holds a special place in the Indian state of Gujarat. With a total population of 153,696, the municipality caters to the varied needs and amenities of the locals and the tourists who flock the region for its attractions. Keeping them well connected with the other cities of Gujarat is an essential feature that is extended to the people with a wide network of trains that ply to and fro from the Veraval Railway station. The Railway Station at Veraval is an impressive structure. The outer facade has a lovely demeanor and is inviting with a promise of safe and secure journeys. Likewise, the inner arrangement of platforms is conducive for the convenience of the passengers with emphasis on tidiness of the facility. The station is not exceptionally busy like modern metros, yet it shares its share of passengers with the buses and takes passengers to their choice of destinations. As an important station of the Western Railways, it never disappoints. The Vrl Tvc Express takes passengers from Veraval to Trivandrum Central while the Vrl Bct Passenger Express makes its journey to Mumbai. The Veraval Pune Express connects Veraval with Pune and the Somnath Express runs to reach Ahmadabad. 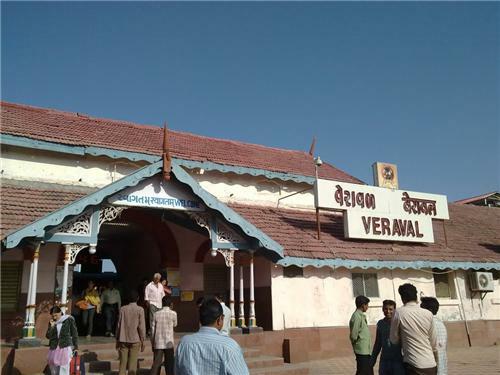 Although, these are the four trains that necessarily originate from Veraval yet there are many trains that pass Veraval while chugging to their destinations. The trains which arrive here from varied stations are the Veraval Express, Pune Veraval Express, the Somnath Express and the Saurashtra Mail. Although, it would be unfair to compare Veraval with the other bustling stations, yet the Government has made all suitable and decent facilities available for passengers who step on the Veraval railway station. Outside the station, there are ample parking spaces for vehicles to facilitate people and there are auto-rickshaws too which provide humble commute within the town. All possible efforts are made to provide excellent services to the passengers with added efforts being made in the direction of beautifying the station.